Their aim, bride Kirsty Gallacher exclusively tells HELLO!, had been to recreate the relaxed ambience of past family holidays. And even with 100 family members and friends joining the celebrations, they achieved that perfectly. “My parents have a house in Arcos and it is such a pretty place,” says Kirsty Gallacher, 34, eldest daughter of former Ryder Cup-winning golf captain Bernard Gallacher and his wife Lesley. “It is set in the hills and is so rich in history — the writer Ernest Hemingway used to go there for inspiration. Because Paul and I have been together for so long, and as we have our two boys [Oscar, three and Jude, aged six months], we didn’t feel that a traditional wedding at home was right for us. Kirsty’s sister Laura, 23, was a bridesmaid and so was Paul’s sister Kerry. For their outfits, Kirsty Gallacher picked pretty dresses made of blush-coloured silk. “I chose an Alexander McQueen design, which a wonderful designer called Lynda Yong, who is based quite close to our home in Surrey, then tweaked,” Kirsty Gallacher reveals. As for Kirsty’s divine Suzanne Neville bridal gown, it could not have complemented the magnificent setting of their wedding more perfectly. An elegant ivory silk dress overlaid with intricate French lace, the look was completed with an exquisite full-length veil. “I’d had a definite picture in my mind of what I wanted and I felt so honoured to have Suzanne make it for me,” Kirsty Gallacher tells HELLO!. 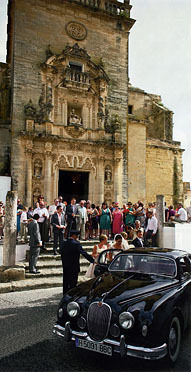 The ceremony took place at Arcos De La Frontera’s magnificent San Pedro Cathedral, perched on a cliff top and looking out over the Andalusian countryside. “As I rounded the corner, I could hear the flamenco choir and it was so overwhelming,” says Kirsty Gallacher, who carried a bouquet of antique roses, which her mum Lesley had chosen. Clutching the arm of her proud dad Bernard, who’d been totally bowled over by the sight of his girl in her bridal gown, Kirsty Gallacher made her entrance. Sadly, Paul’s father Brian died five years ago, and there was sadness, too, that Kirsty’s maternal grandmother, Peggie, could not be with them, as she died two years ago. “But my mum sewed my grandmother’s wedding ring into the back of my dress and Paul wore his father’s ring, so although they couldn’t be there, they were with us,” says Kirsty Gallacher. The couple left the church for the reception at Arcos Gardens Golf & Country Club in a classic Jaguar, which had trouble negotiating the narrow cobbled streets, causing some hilarity among onlookers. With a bit of manoeuvring the driver finally managed it and everyone cheered,” laughs Kirsty Gallacher. At the Arcos Gardens, guests enjoyed a champagne reception and were entertained by a traditional Spanish guitarist, who also played in the olive garden, where the main reception took place. Big vases containing church candles flickered in the evening light. “The place was dotted with lots of little tea lights. It looked stunning,” says Kirsty Gallacher. Speeches were made before the main meal, with England rugby international prop David Flatman taking on the role of master of ceremonies with singular charm. Despite his nerves, groom Paul’s speech struck the perfect balance between humorous and heartfelt “He did come out with some very funny lines before he got to, ‘And I’m so glad you’re my wife,’” reveals Kirsty Gallacher. Then it was time to eat. Embracing the Mediterranean flavour of the occasion, guests enjoyed a traditional tomato-based dish called salmorejo followed by fillet of beef and a lemon tart. “It was perfect, sitting out among the olive trees, chatting, laughing, eating and drinking,” says Kirsty Gallacher. But, unbeknown to her, Paul had arranged a special surprise. Last year, the couple attended the wedding of friends where they had been entertained by an acoustic band called The Gypsy Queens. The newlyweds stayed in Spain for a week’s honeymoon, but are now home and it’s straight back to work for Kirsty Gallacher, who takes over Lorraine Kelly’s slot on GMTV for two weeks, starting on 16 August. 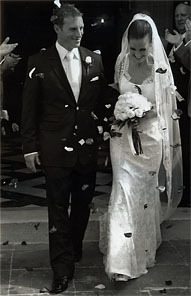 “We wanted our wedding to be a real family occasion, with close friends and lots of children, and we had that. But it was more incredible than we could ever have wished for,” Kirsty Gallacher tells HELLO! Paul adds: “The moment I will treasure most is walking out of the cathedral, arm in arm with my wife, to be greeted by our two sons and all our friends and family in the most beautiful and intimate of settings.